A crappy Irish golf blogger is said to be waiting patiently by his laptop this morning in the hope that President Donald Trump will Retweet a video he just posted on Twitter of The President knocking a guy off his chair at the Tour Championship. "I've the video posted for about 30 minutes now and still no retweet," said the crappy blogger. "It's 5am over in Washington still so I'm hoping it's because they are all still asleep. The Secret Service guys have probably seen it by now and have a great laugh altogether. I'm sure they'll show it to the Prez over breakfast, he'll retweet and I'll be rich rich rich!" 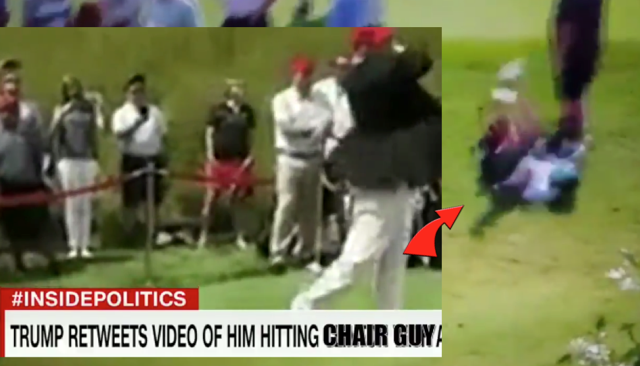 The crappy blogger is said to have thought up the ingenious idea of splicing Mr Trump's swing with Jhonattan Vegas knocking a guy off his chair at the Tour Championship to make it look like The President had actually hit shot. Here's the video which at time of posting had one like.